You wouldn’t know it from the recent Ken Burns special, but Theodore Roosevelt was no stranger to recording. Here are two of his Edison cylinders, recorded in his Oyster Bay home — politicians were among the very few to whom recording companies would dispatch a mobile unit at the time. 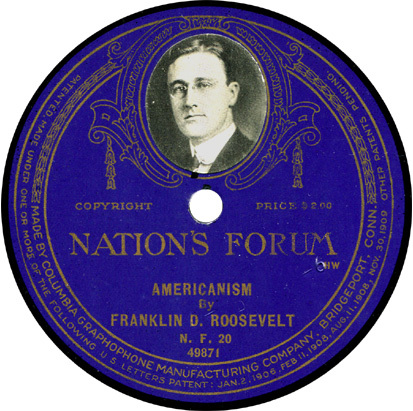 His sister Corinne’s only known commercial recording, backing Warren G. Harding in the 1920 presidential election, is among the rarest of the Nation’s Forum issues. And finally, we have a young FDR, in his first known recording, already touching on the themes that would put him in the White House twelve years later. CORINNE ROOSEVELT ROBINSON: Safeguard America!